One of the best characters from Star Wars: Return of the Jedi may be coming back to a galaxy far, far away in a huge way. Jabba the Hutt is rumored to have a role in the upcoming but still untitled Han Solo movie. Now it sounds like Lucasfilm has bigger plans in mind for the giant alien space gangster. 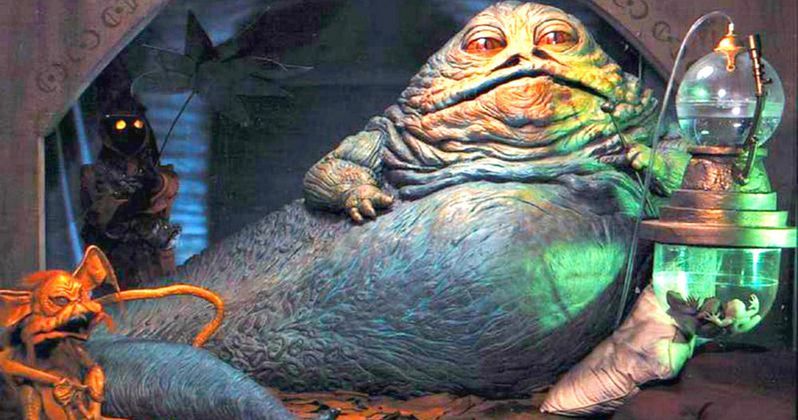 The studio is reportedly already developing an entire Star Wars spin-off movie centered on Jabba the Hutt. Variety reported on the news that Billy Elliot director Stephen Daldry is currently in negotiations to helm the often discussed Obi-Wan Kenobi spin-off. In the report, they note that there are several other standalone movies in development at Lucasfilm and one of them is about Jabba the Hutt. Here's what Variety had to say about it. "Rogue One was the first of the standalones, and Disney is currently shooting an untitled origin tale of beloved smuggler Han Solo. Some of the other standalones in development include a Jabba the Hutt story and a Boba Fett movie." As far as the overall Star Wars timeline goes, Jabba the Hutt died being choked to death at the hands of Princess Leia in Star Wars: Return of the Jedi. Prior to that, he used Tatooine as his main base of operations and he is a pretty important figure in the seedy underworld in the Star Wars universe. The character was also added into a scene in Star Wars: A New Hope in the 1997 special editions, but most fans would rather forget about that scene. He also had a brief cameo in The Phantom Menace. Beyond that, the character hasn't been explored on screen, but he has been included quite a bit in the new comics. Specifically, he had some very interesting storylines in the Darth Vader comic. Despite having relatively minimal screen time, Jabba the Hutt is a character that has fascinated fans for years. Given what has been explored in the expanded universe, he is a character that could definitely benefit from a movie. It would also allow us to explore that Star Wars criminal underbelly, which is something that hasn't really been tackled in a Star Wars movie yet. Though, having to read subtitles for two hours and having your main character as a slow moving slug-like alien might present its issues. In addition to the Jabba the Hutt spin-off and the Boba Fett movie, which at one point had Fantastic Four director Josh Trank attached before the movie fell apart, another report from The Hollywood Report mentions that a Yoda movie is also being considered. So the odds of all these Star Wars standalone movies actually happening are rare, but we are getting a glimpse at the potential future of the Star Wars franchise. Jabba the Hutt Teased in Latest Han Solo Set Photo?